Wrought iron shutters are an elegant and popular addition to any style of home, and they are most often found as accents to homes that encompass the old world or Tuscan design styles. Any type of shutter can be a strain on the pocketbook to purchase and difficult to install, and wrought iron is not any different. It is essential that the ideal shutters are chosen and a professional is enlisted to assist or complete the installation process. 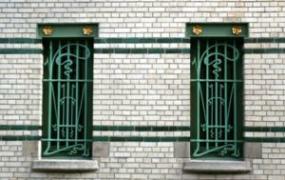 In the past, wrought iron was produced on a commercial scale for use in all aspects of building. However, today, they use the metal for decorative pieces in the exterior areas surrounding a building. Many homeowners focus solely on the appearance of shutters, but there are other factors to consider before you find the right metal shutters. Three of the most important elements to consider in wrought iron shutters are size, use and finish. However, an informed property owner will choose the right material and not be fooled by an imposter. It is imperative to have the correct size when purchasing wrought iron shutters for a home improvement project. Shutters that are too large or too small will not fit or function properly. For this reason, many people decide to have their doors or windows measured by a professional. Professionals cannot only insure accurate measurements, but they can custom make wrought iron pieces for any window or door. Custom shutters and precise measurement numbers achieve an elegant look with little to no hassle. Shutters are not just a decorative feature on a home, especially fixtures constructed from wrought iron. Install these shutters to increase security measures for the home's occupants. Wrought iron is difficult to cut through, and it is almost impossible to penetrate. Like any metal, wrought iron has its positive and negative attributes. For instance, it can vary in appearance. As a result, it is important for any potential purchaser to take into account other wrought iron pieces in and around their home. These pieces and the shutters should match for a cohesive look. In order to enjoy a long lasting relationship with all types and designs of wrought iron exterior home embellishments, including shutters, it is important that all solid wrought iron have a power coated finish. The finish will protect the metal for years to come, and a homeowner can enjoy a beautiful dark iron adornment for a longer duration of time. For shutters, consider where you will install the product. Professionals can offer installation choices based on particular homes and locations. However, exterior shutters mounted to the home's frame are usually the most secure and aesthetically pleasing way to install this specific type of shutter. However, there are other options. Some designs can be installed indoors. This interior installation allows for easy removal by the resident in case of an emergency. When looking for the best wrought iron exterior pieces and shutters, most people consider design and visual appeal. Both are important factors when finding the ideal shutters for any home. 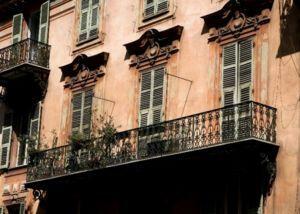 For some people, the look of shutters that are wrought iron can be enough. After all, wrought iron can be an expensive material to purchase, and faux wrought iron is available for a fraction of the usual cost.